Next, you must create a launch configuration for the Lauterbach hardware. In the IDE, select Debug As > Debug Configurations to open the Launch Configurations dialog. 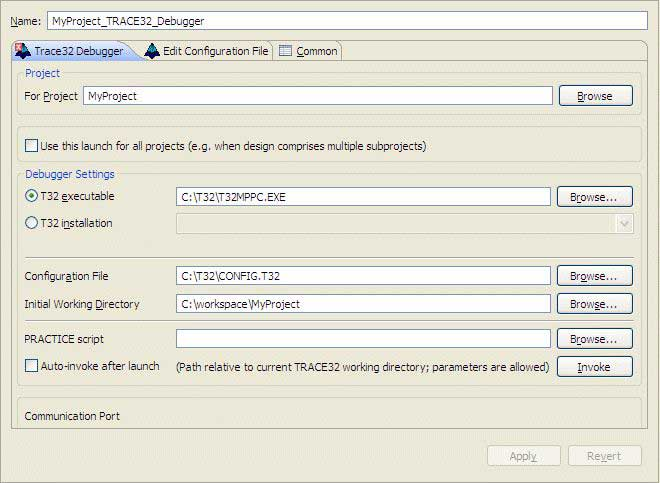 In this dialog, select Lauterbach TRACE32 Debugger and add a new configuration. Note: To use the Lauterbach Trace32 In-Circuit Debugger plugin, it is mandatory to have a project. Breakpoint synchronization and edit-source functionality work only with files contained in a project; otherwise, the plugin doesn't know which Trace32 instance it belongs to. In the T32 executable field, type the path to the Trace32 application that you want to associate with this launch configuration. By default, the Trace32 installation process will have located the executable in the folder c:\T32; however, the executable depends on your target architecture (e.g., T32MARM.EXE for ARM, T32MPPC.EXE for PPC). In the Configuration File field, type the name of the Trace32 configuration file to use with the executable. After specifying the configuration file, you can edit it through the Edit configuration File tab. This configures Trace32 to accept commands via the built-in socket API, which is a prerequisite for connecting with the plugin. Note that the port number used in the example (20006) is arbitrary, but must be unique among all concurrently active connections between Trace32 and the IDE, and must not be used by other host programs. You don't need to configure the plugin; it will parse the chosen configuration file and extract the relevant parameters. Click Apply to save the configuration, then click Close to exit the debug dialog.